Oprah's Time's Up Interview: How to Rehab Bad Men? This morning, CBS broadcast a star-filled “Time’s Up” panel Oprah hosted on the day after she gave the rousing Golden Globes “Time’s Up” speech which repeatedly hit the phrase “time’s up” in its crescendos. 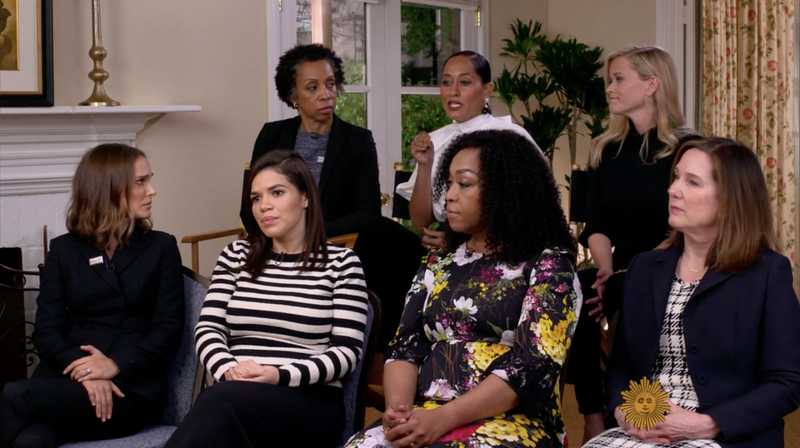 The panel included famed Time’s Up members Reese Witherspoon, Shonda Rhimes, America Ferrera, Natalie Portman, Tracee Ellis Ross, Lucasfilm President Kathleen Kennedy, and entertainment attorney Nina Shaw. The thing is, Oprah’s not totally sure what “Time’s Up” is yet, and neither is anybody else, which is okay. Effectively, it is a loose organization of Hollywood women which Reese Witherspoon reportedly started with a series of casual emails. It’s started a $16 million defense fund subsidizing legal support for victims of workplace harassment, to be administered by the National Women’s Law Center. It is also a penitence fund for actors like Rebecca Hall, who donated her salary from the latest Woody Allen movie, and Mark Wahlberg, who reportedly donated the $1.5 million he made on re-shoots of “All The Money in the World” in solidarity with his co-star Michelle Williams, who made $1,000. “Just having a conversation for the world” [laughs]. Oprah demands to know who the leader is and how something can operate without a leader; the answer is it’s not about that, Oprah. Oprah asks questions about how society should proceed; Portman, Ross, et al don’t give a satisfying soundbite, other than repeat the importance of staying vocal right now; Ross calls it a “constructive fury.” In all, though, they seem to concede that the lack of clear conflict-resolution structure is the point when Oprah asks: what happens to bad men? “So, once somebody’s been accused of sexual harassment and loses their job, should they ever work again?” Oprah asks.